Is M1 power pack available? 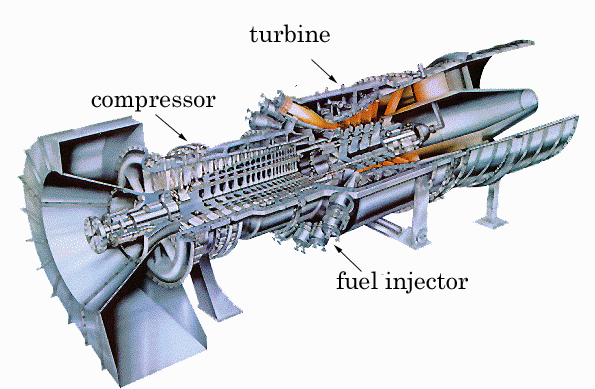 Gas turbine is a kind of internal combustion engine that extracts power directly from the combusted hot gas. The main difference from a steam turbine is that the power is directly derived from combusted gas, not from steam boiled by combusted gas. Diesel engines and gasoline engines are well known motive power, commonly used around us and gas turbine engines may not be familiar to us. But well known jet engine is a kind of gas turbine and most helicopters and propeller planes are powered by gas turbine except for some small types. Other vehicles such as Jetfoil, high speed ship, most worships such as destroyers and cruisers are propelled by gas turbine engine. In power generation, gas turbine is main power source especially in emergency purpose and large power plant. Recently cogeneration system to supply heat and power is spreading in convenience store and hospital and gas turbine is becoming more and more familiar to us. Gas turbine requires very precise manufacturing process, but its basic component is simple. 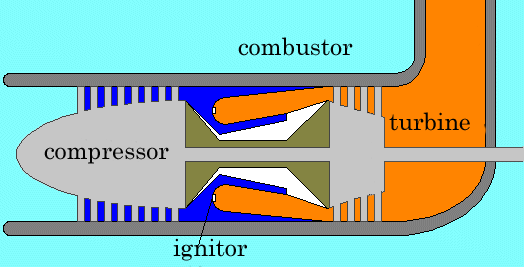 The schema above shows the three major components, compressor, combustor and turbine. Compressor is usually consists of core shaped cylinder with many fan blades attached in rows High speed rotation of these fan blades compresses air and send it to the combustor. 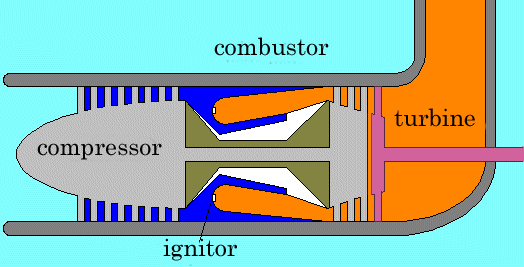 In combustor, fuel is injected in to the compressed air and ignited. Then combusted high pressure hot gas enters into the turbine section, spins the turbine and exhausted gas is released in the atmosphere. Compressor and turbine are directly coupled and turn as a single unit. Much part of the power derived from the turbine is used to spin the compressor and residual power can be used to drive generator or pump. In a jet engine, residual power is used as a thrust . As this gas turbine has single shaft in one engine, it is called "single shaft gas turbine engine". This type of gas turbine cannot spin at low speed, because low speed rotation of compressor cannot produce high pressure compressed air, resulting in combustion failure and engine stall. So single shaft gas turbine is usually applied to power generation, where variable speed is not required. In the next schema, turbine is separated into two part, each can spin independently. Compressor and left turbine turn as a single unit and right turbine turns freely. Therefore, the output shaft can stop while engine is running and can start at zero speed, can turn at any speed. This gas turbine has two separated shaft and then called "two shaft gas turbine" or "free shaft gas turbine". Even if output shaft is stopped, gas generator (compressor-turbine unit) can turn at full speed,　high pressure gas is continuously supplied and high torque is produced. This type of gas turbine has high torque at low speed and comparably high efficiency at low speed, so it is suitable for propelling cars and trains. This section will illustrate the torque-speed feature of gas turbine. In the next schema, the blue colored line shows the relation between rotation speed and torque of the two shaft gas turbine. The actual engine has somewhat more torque at low speed, but approximates to a straight line. 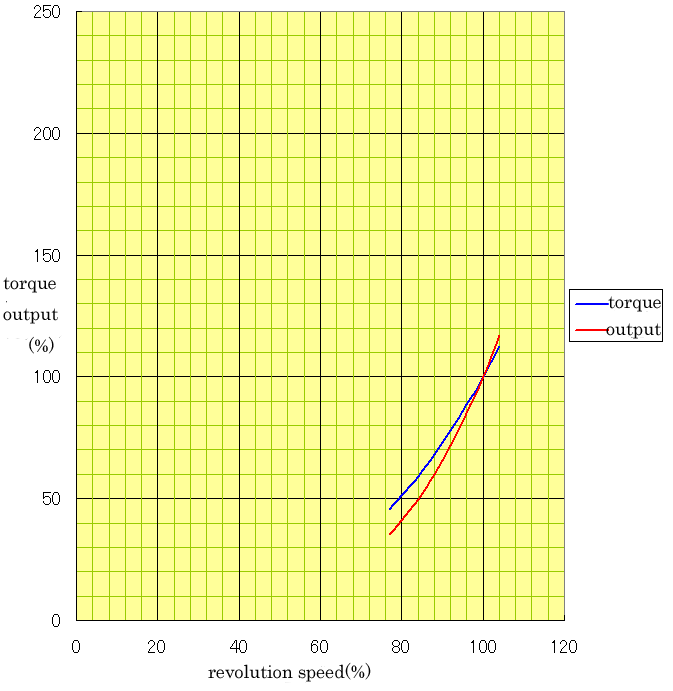 The red colored curve shows the relation between the engine speed and output. They vertical axis is torque or output in percentage and horizontal axis is engine speed in percentage. At (100,100) point, engine delivers the best performance. 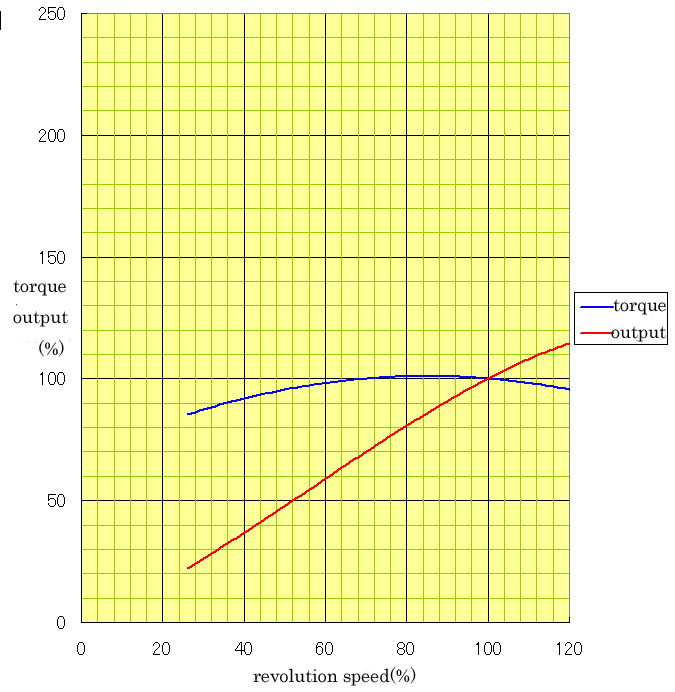 This graph indicates that when the engine speed reduces to 60%, the engine torque increases 140% and when the engine speed reduces to 40%, the engine torque increases 160%. If you are car nut and interested in car technology, you will be eager for this engine. Since engine output is a product of a torque and speed, engine output is comparably maintained at low speed. At 40% engine speed, 60% output is maintained.. This character is advantageous for rail applications where large tractive effort is indispensable at start or low speed. Diesels and Wankels currently use in cars do not have this and they have a nearly constant torque regardless of engine speed. This means that when the engine speed decreases, the engine output decreases as shown in the next schema. These engines require mechanical or electrical torque converter to overcome this defect. As is mentioned above, two shaft gas turbine has a feature of built-in torque converter and even single stage direct drive mechanical transmission can be available. In Japanese national railways, Kiha 391 turbine powered prottype was produced and equipped with no torque converter and in other counties some turbine powered locomotive had no torque converter or electric transmission. The defects of the two shaft gas turbine is that the increase of its component and weight. The single shaft gas turbine is simple and as output shaft is coupled to high speed rotating compressor, it has large inertia of rotation, leading to a good stability in speed of revolution. This is very effective in the power generation where the constant speed is important to maintain the frequency. The next schema illustrates the relationship between torque and speed of the single shaft. It is very different from the two shaft engine and it seems very inappropriate to drive vehicles. The most discriminating feature of gas turbines against reciprocating internal combustion engines is the amount of gas to be processed in the same engine size. A gas turbine can process large amount of gas in a small engine, resulting in very high power weight ratio. Can you imagine the 500kg weighing 2 cubic meter sized turbine engine provides the output of 5000 hp ? In diesel engine, the size will be the same of a large truck. Even a state of the art 300 KW electric motor used in the Shinkansen weighs arround 300kg. This picture shows 25000KW gas turbine engine. You can guess the size of the engine by comparing the human standing next to it. The engine output is 25000KW, not 2500KW, and it is not a maximum output, it is a continuous rated output. It is far more powerful than the Shinkansen series 500 total train set, consists of 16 motive cars. To achieve this performance with other engines, it will be building-sized. The jet engine used in "Jumbo Jet" is as large as this. You may insist Jumbo's engine is far larger, but as a turbofan engine has a large propeller around the engine core, engine core itself is very small. The next feature of a gas turbine is it can use many kind of flammable gases and liquids as a fuel. For example, gasoline, light oil, kerosene, alcohol, natural gas, hydrogen. Rregenerative fuels such as alcohol and methane have lately attracted considerable attention and gas turbine is well fit them. The next feature is that gas turbine can produce large torque at low speed. As is mentioned above, this is an important feature to drive vehicles, which eliminates sophisticated transmission and increases acceleration. The next schema illustrates this advantage. 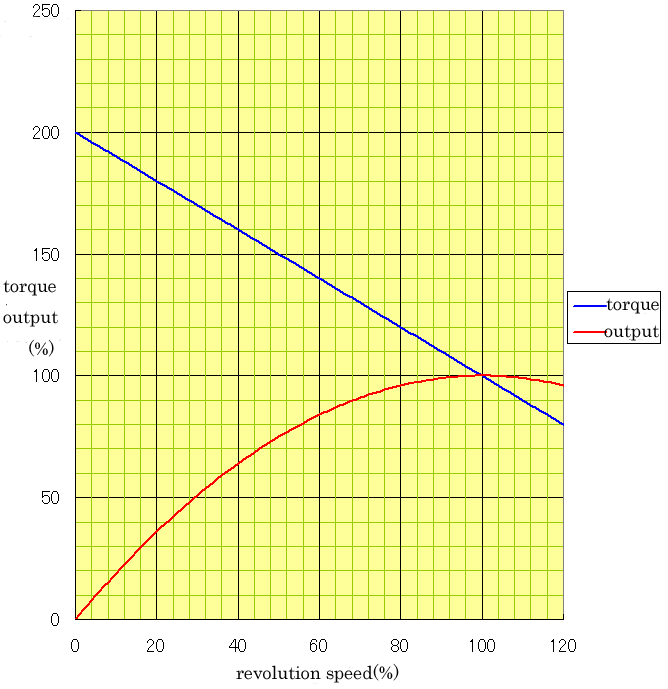 This is a torque and output comparison of the turbocharged tank diesel engine and the three shaft gas turbine showing gas turbine's high torque at low speed advantage. Recently high efficient and light weight electric transmission is available and this advantage has been fading away in the vehicle drive system, but it is convenient where simplicity and light weight are important factor. The next is that gas turbine is vibration free and not so noisy. Gas turbine mainly produces high frequency noise and it is easily reduced by silencer. On the other hand, diesel engine produces much low frequency noise with severe vibration and makes it difficult to reduce noise. You can experience this difference when you ride on a jetfoil. A turbine powered jetfoil is vibration free and less noisy, but a diesel boat is far noisy and full of vibration. The turbine powered jetfoil is well silenced, produces noise about 90-100dB at the near outside of the ship. Considering its output power level of 8000hp, it can be said that this is a silent vehicle. On the other hand, Japanese national railway's direct drive turbine powered test car Kiha391, produced early 70's was much more noisy, which produced noise over 120dB while starting at full power. Other feature is that gas turbine consumes less lubbricating oil than reciprocating engine and does not require a large cooling system. Usually, reciprocating engines are hard to start up in cold weather but gas turbine is easy to start in such a condition and long time idling to warm up. Gas turbine is environmentally more friendly than other internal combustion engine. When a diesel train starts at a station, the station will be filled with noxious blue-white or black smoke and you may be hard to see and breath. Imagine a airport crowded with diesel powered large airplanes and there will be severe air pollution around the airport. The most serious problem is that gas turbine consumes much fuel especially in small engine. When working at part load, the efficiency is seriously reduced. At full load some gas turbines may be more fuel efficient than some high speed diesel engines but this is not true at part load. The next graph shows the relationship between heat rate and output power. When output power is reduced 30% then heat rate almost doubles. The next graph shows the change of thermal efficiency of 5000 hp class diesel and gas turbine locomotive as a function of engine output power. This class of gas turbine is classified as middle size and it's part load efficiency is relatively good but still worse in comparison to diesel locomotive especially at low horsepower. And what is even worse, gas turbine consumes much fuel than other reciprocating engines at idle. As is mentioned above, compressor continuously must spin at high speed to produce effective compressed air to maintain engine idling, When gas turbine is idling, turbine spins at 60% speed or more. For example, 1000 hp class gas turbine should spin at over 10000 rpm, and if the engine is kept idling for one hour it will consume over 40kg of fuel, this ammount will be four times or more than that of diesel. This is not so serious in high speed rail application where long time high speed cruising is common and high cruising power is required. But in ordinary rail application coasting time is much longer than powering time resulting in bad fuel economy. In bad conditions, fuel consumption may be twice as much as that of diesel train. In american heavy duty freight train, it is estimated that 5000 hp class gas turbine operation will increase fuel consumption 25% against diesel operation. Another aspect of high fuel consumption is that low speed operation of gas turbine worsen the fuel efficiency. It occurs even in two shaft gas turbine in spite of it's high torque at low speed. Turbine is designed to bring out it's best performance at specific speed. This is called as "designed point". When turbine is spinning at this speed and then axial load increases, rotation speed will decrease and balance speed because reduction of turbine speed increases its torque. In this process, amount of fuel consumed does not change. This is the distinguishing difference between turbine and reciprocating engine. In reciprocating engine, same amount of fuel is consumed at each explosion and then fuel consumption is proportional to the rotation speed of the engine. But gas turbine is continuous combustion engine and amount of fuel injection is not influenced by the engine speed. If turbine torque doubles at half speed, there is no problem but as turbine efficiency worsens at rotation speed out of designed point, turbine torque does not double but approximately 1.5 times. This means 25% loss occurs at this speed. High cost of the engine is also significant barrier for rail applications. Mass produced micro gas turbine may have a competitive advantage over other reciprocating engines, but 5000 hp class gas turbine cost three to four times higher than a comparable diesel engine. This cost is roughly the same as the entire cost of the diesel locomotive. Turbine's high speed rotation requires sophisticated heavy reduction gear box. Middle class engines spin 10000 to 20000 rpm and small class over 100000 rpm. But recent advancement of the high speed alternator technology has enabled alternator to couple directly to a turbine shaft, resulting in very light weight generator set. Gas turbines absorb a lot of air and exhaust a lot. Consequently silencer and air filter occupy large space and this may influence the cabin space or cargo space. Gas turbines require clean air to keep fuel efficiency because if compressor blades are polluted, compressor efficiency decreases and total efficiency decreases. There is no such problem in aircraft which flies high altitude but in land or sea application engines must absorb particle rich air. Gas turbines produce large sound when it start up at full power while the output shaft is stalled. This is the two shaft gas turbine specific phenomenon, occurs when a direct drive train starts at a station. The cyclic load profile of the typical locomotive operation may be a challenge to gas turbines. Gas turbines are usually used at constant power. But locomotive's operating power varies dynamically, from idle to maximum power. This increases heat stress and affects engine life.